Temporary borders created by advancing German and Soviet troops. The border was soon readjusted following diplomatic agreements. 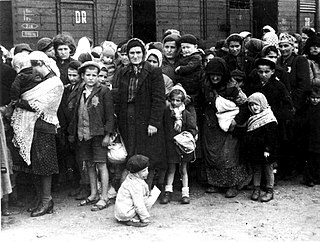 Seventeen days after the German invasion of Poland in 1939, which marked the beginning of the Second World War, the Soviet Union invaded the eastern regions of Poland (known as the " Kresy "), which Poland re-established during the Polish–Soviet War, and annexed territories totaling 201,015 square kilometres (77,612 sq mi) with a population of 13,299,000. 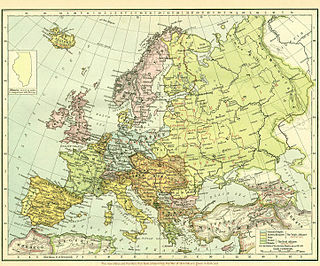 Inhabitants besides ethnic Poles included Czech, Lithuanian, Belarusian, Ukrainian, Jewish, and other minority groups. Most of these territories remained within the Soviet Union in 1945 as a consequence of European-wide territorial rearrangements configured during the Tehran Conference of 1943. Poland was “compensated” for this territorial loss with the pre-War German eastern territories much of which had been devastated during the war, and had been looted and pillaged by the Red Army. 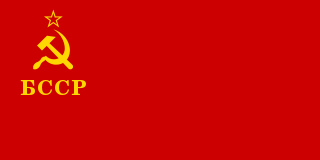 Communist Poland described the territories as the " Recovered Territories ". The number of Poles in the Kresy in the year 1939 was around 5.274 million, but after ethnic cleansing in 1939-1945 by Nazi Germany, the Soviet Union and Ukrainian nationalist forces consisted of approximately 1.8 million inhabitants. The post-World War II territory of Poland was significantly smaller than the pre-1939 land areas, shrinking by some 77,000 square kilometres (30,000 sq mi) (roughly equaling that of the territories of Belgium and the Netherlands combined). The former eastern territories of Germany are those provinces or regions east of the current eastern border of Germany which were lost by Germany after World War I and then World War II. Recovered Territories was an official term used by the Polish People’s Republic to describe the territory of the former Free City of Danzig and the parts of pre-war Germany that became part of Poland after World War II. The rationale for the term "Recovered" was the Piast Concept that these territories were 900 years ago part of the traditional Polish homeland. They had been part of, or fiefs of, a Polish state during the early medieval Piast dynasty. Over the centuries, however, they had become Germanized through the processes of German eastward settlement (Ostsiedlung) and political expansion (Drang nach Osten) and for the most part did not even contain a Polish-speaking minority. In addition, some regions, like Western Pomerania, were controlled by Polish kings for only about 50 years during the early Middle Ages followed by more than 800 years of German rule, making the argument of traditional Polish homeland rather based on nationalistic ideas than on historical facts. Nowadays the term Western Territories is more popular because of its ideological neutrality. 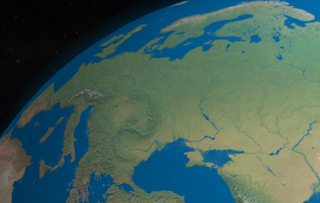 Northern Europe is a general term for the geographical region in Europe that is roughly north of the southern coast of the Baltic Sea, which is about 54°N. Nations usually included within this region are Denmark, Estonia, the Faroe Islands, Finland, Iceland, Latvia, Lithuania, Norway and Sweden, and less often the United Kingdom, the Republic of Ireland, northern Germany, northern Belarus and northwest Russia. Major metropolian areas include Oslo, Copenhagen, Stockholm, Goteborg and Helsinki. 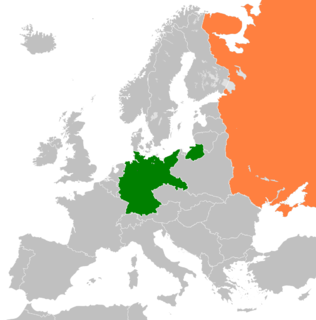 Lithuania, adjacent to East Prussia, would be in the German sphere of influence, although a second secret protocol agreed in September 1939 assigned the majority of Lithuania to the USSR. According to the secret protocol, Lithuania would retrieve its historical capital Vilnius, subjugated during the inter-war period by Poland. The Polish–Soviet border, as of 1939, had been determined in 1921 at the Treaty of Riga peace talks, which followed the Polish–Soviet War. 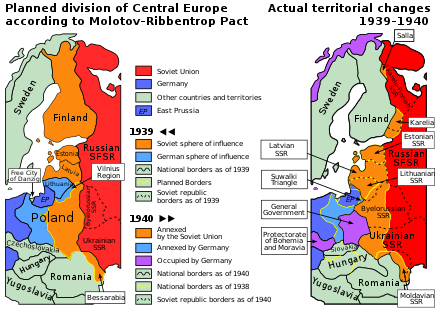 Under the terms of the Molotov–Ribbentrop Pact, two weeks after the German invasion of western Poland the Soviet Union invaded the portions of eastern Poland assigned to it by the Pact, followed by co-ordination with German forces in Poland. See map. Territories around Wilno (now Vilnius) annexed by Poland in 1920, were transferred to Lithuania on the basis of Lithuania-Soviet Union agreement (however Lithuania was soon annexed by Soviet Union to become the Lithuanian SSR). Other northern territories were attached to Belastok Voblast, Hrodna Voblast, Navahrudak Voblast (soon renamed to Baranavichy Voblast), Pinsk Voblast and Vileyka (later Maladzyechna) Voblast in Byelorussian SSR. The territories to the south were transferred to the Ukrainian SSR : Drohobych Oblast, Lviv Oblast, Rivne Oblast, Stanislav (later known as Ivano-Frankivsk) Oblast, Tarnopil Oblast and Volyn Oblast. District Galicia , East Galicia, which was incorporated into the General Government and became its fifth district. 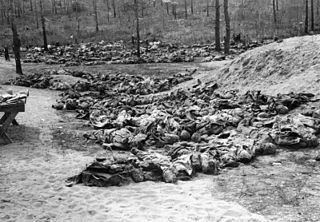 During 1943–1944 ethnic cleansing operations took place in Ukraine (commonly known as the Massacres of Poles in Volhynia) which brought about an estimated 100,000 deaths and an exodus of ethnic Poles from this territory. 1 2 Elżbieta Trela-Mazur (1997). Włodzimierz Bonusiak; Stanisław Jan Ciesielski; Zygmunt Mańkowski; Mikołaj Iwanow, eds. Sowietyzacja oświaty w Małopolsce Wschodniej pod radziecką okupacją 1939–1941. Sovietization of education in eastern Lesser Poland during the Soviet occupation 1939–1941. Kielce: Wyższa Szkoła Pedagogiczna im. Jana Kochanowskiego. pp. 294–. ISBN 8371331002 – via Google Books. Of the 13.5 million civilians living in Polish areas annexed by the Soviet Union according to the last official Polish census, the population was over 38% Poles (5.1 million), 37% Polish Ukrainians (4.7 million), 14.5% Belarusians, 8.4% Jews, 0.9% Russians and 0.6% Germans. Also in: Wrocławskie Studia Wschodnie, Wrocław, 1997. ↑ Telegram of the German Ambassador in the Soviet Union, (Schulenburg) to the German Foreign Office Moscow, Moscow, September 16 "Archived copy". Archived from the original on 2007-04-30. Retrieved 2007-04-30. CS1 maint: Archived copy as title (link): ...the Soviet Union had thus far not concerned itself about the plight of its minorities in Poland and had to justify abroad, in some way or other, its present intervention. ↑ various authors (2001). "Stalinist Forced Relocation Policies". In Myron Weiner, Sharon Stanton Russell. Demography and National Security. Berghahn Books. pp. 308–315. ISBN 1-57181-339-X. ↑ Bartłomiej Kozłowski (2005). ""Wybory" do Zgromadzeń Ludowych Zachodniej Ukrainy i Zachodniej Białorusi". Polska.pl (in Polish). NASK. Archived from the original on June 28, 2006. Retrieved March 13, 2006. ↑ Karolina Lanckorońska (2001). "I - Lwów". Wspomnienia wojenne; 22 IX 1939 - 5 IV 1945 (in Polish). Kraków: ZNAK. p. 364. ISBN 83-240-0077-1. 1 2 Fischer, Benjamin B., "The Katyn Controversy: Stalin's Killing Field", Studies in Intelligence , Winter 1999-2000. ↑ Nick Shepley (2015). Hitler, Chamberlain and Munich: The End Of The Twenty Year Truce. Andrews UK Limited. p. 69. ISBN 1783331089. The Poles come from different West Slavic tribes living on territories belonging later to Poland in the early Middle Ages. Polesie Voivodeship was an administrative unit of interwar Poland (1918–1939), named after the historical region of Polesia. It was created by the Council of Ministers of the Second Polish Republic on February 19, 1921, as a result of peace agreement signed with the Russian and Ukrainian SSRs in Riga. Polesie Voivodeship was the largest province of interwar Poland. It ceased to function in September 1939, following the Nazi-German and Soviet invasion of Poland in accordance with a secret protocol of the Nazi–Soviet Pact of aggression. In the aftermath of the German and Soviet invasion of Poland, which took place in September 1939, the territory of Poland was divided in half between Nazi Germany and the Soviet Union. 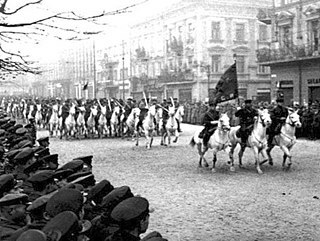 The Soviets had ceased to recognise the Polish state at the start of the invasion. Both regimes were hostile to the Second Polish Republic as much as to the Polish people and their culture, thus aiming at their destruction. Since 1939 German and Soviet officials coordinated their Poland-related policies and repressive actions. For nearly two years following the invasion, the two occupiers continued to discuss bilateral plans for dealing with the Polish resistance during Gestapo-NKVD Conferences until Germany's Operation Barbarossa against the Soviet Union, in June 1941. The occupation of Poland by Nazi Germany and the Soviet Union during the Second World War (1939–1945) began with the German-Soviet invasion of Poland in September 1939, and it was formally concluded with the defeat of Germany by the Allies in May 1945. 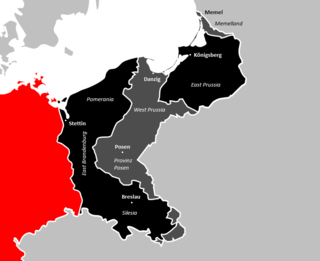 Throughout the entire course of the foreign occupation, the territory of Poland was divided between Germany and the Soviet Union (USSR) with the intention of eradicating Polish culture and subjugating its people by occupying German and Soviet powers. In summer-autumn of 1941 the lands annexed by the Soviets were overrun by Germany in the course of the initially successful German attack on the USSR. After a few years of fighting, the Red Army drove the German forces out of the USSR and across Poland from the rest of Central and Eastern Europe.